And don’t piss ‘im off like nails on a chalkboard, wow. Thanks Nick, I Love It! 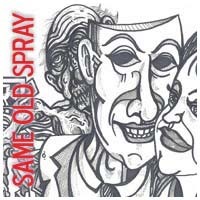 “Same Old Spray (Nick DiMaria Remix)” -Hangnail. glad to hear it. I like to make tracks that are a complete reworking of the original. I started just taking your tracks and juicing them up a bit with the same structure, but started to hear your growling voice and thought it would be good as a tribally-angry piece. And that’s how it wound up the way it did. I can go over specifics, but it wasn’t too extraordinary a task so it’s not much to avail. essentially, I took the guitar rhythm. used it pretty much as is, but added a lot of digital saturation, then noticed it was sounding a bit eighties from the sound I gave it. So, I put it through some filters. It’s actually one of the sounds you hear throughout the track, but it’s so filtered that it sounds like a synth. This happens alot when I remix. I take the raw sound and pass it through effects to get the various sounds, but at the rhythms they were played with. Completely changes the feel of a track while maintaining its rhythms. then, I took that floating guitar line, added delay and verbs to fatten it and make it a sailing type of line. I think it gives the track ‘length’ and continuity. I did cheat and used some percussive loops…I played with the EQ, saturation, drive, filters, and placement in the audio field to get them sounding growly. I wanted it to be distorted like the original track. give it some guts. I didn’t saturate it too much b/c then it wouldn’t have any of the nice bass in the kick. The vocals are passed though distortion, delays, filters, and a beat processor that arranges the percussive parts of the voice so that it’s rhythmic and a bit phonetically driven. I like the results b/c you can make out the idea of the vocal line without being hit over the head with the meaning. intentional masking of the content. makes it more relistenable b/c people can interpret it the way they want to. I like the bass line. just took a stock bass, fattened it up and gated it some to make it enter and leave completely. sounds nice and tribal to me. I took another of your vocals and passed it through an autopan, which also had a synth processor. gives the synthy stuff in the middle. give it a bit of progressive house feel to keep it moving. track just felt right as it formed. organic growth. the best kind. This entry was posted in remixes, songs and tagged remix song. Bookmark the permalink.